You’ll be on the look out for leprechauns with our “Luck o’ the Irish Scarf”! 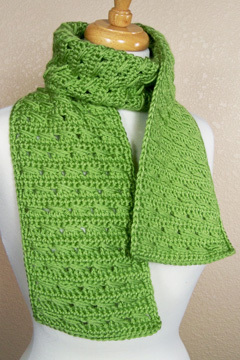 The stitch pattern used is an easy-to-memorize 4-row repeat that works up in a jiffy! Add a simple sc edging and your scarf is complete! The pattern includes written instructions, as well as a symbol crochet chart and step-by-step photos for making the 4-dc cross stitch. Choose any solid color or color-changing yarn and fiber content that you desire to make your scarf unique! Note: Photographed model made with Caron Simply Soft Yarn.